Honeymoon in Mysore as you explore historic monuments and virginal greens steeped in an ever present sandalwood fragrance. Enjoy a 140-kilometer drive from Bangalore to Mysore with your beloved and pass by some of the most soothing and picture perfect vistas. Walk along naturally canopied avenues; seek blessings at ancient sacred temples and tour monumental grandeur as you enjoy honeymoon tours in Mysore, Karnataka, South India. See local palaces and picnic at manicured gardens adorned with an explosion of blossoms that paint the green Mysore landscape in a riot of bright colors. Visit the Chamundeshwari temple on the Chamundi Hills as you honeymoon in quaint Mysore, Karnataka, south India. See the exotic Pushpakashi flower garden, tour the National History Museum, Bogadi Lake, Chamarajendra Zoological Gardens, Tipu's Palace and the enchanting Mysore Silk Factory. Tour the stunning Brindavan Gardens, Jaganmohan Palace and Art Gallery, St. Philomena's Church, Melkot and Daria Daulat Bagh as you honeymoon in tranquil Mysore, Karnataka in South India. 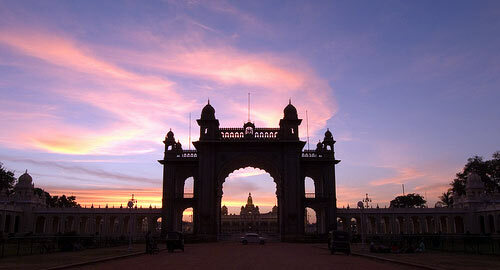 Easily approachable, Mysore is accessible from Bangalore, Coimbatore, Ooty, Mangalore and Calicut. The second largest city of Karnataka and erstwhile bastion of the Wodeyar kings, Mysore is a glamorous tour destination rich in cultural traditions and local crafts made of sandalwood. Essentially a tableland, fringed with luxuriant green forests and ancient monuments and palaces, Mysore is a captivating honeymoon destination in Karnataka, South India.